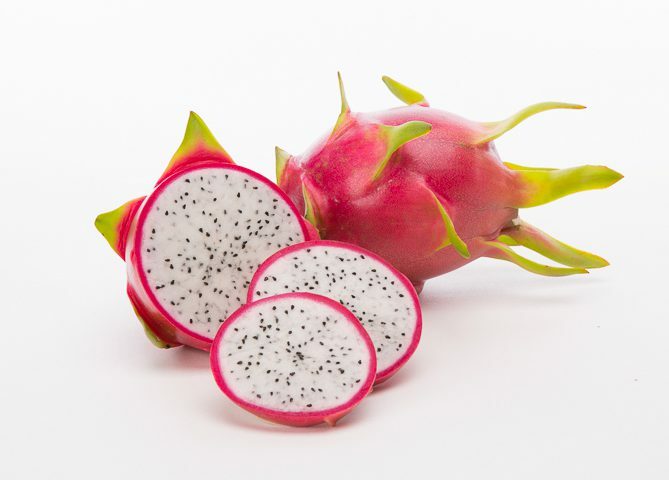 Oval to oblong and up to four inches long, dragon fruit may be red, peach-colored or yellow. The fruit’s texture is similar to that of a kiwifruit with a spongy pulp colored white or sometimes pinkish red. The seeds eaten together with the flesh have a nutty taste with a mild sweetness. 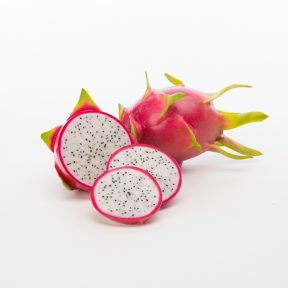 Names: Dragon Fruit, Pitaya, Strawberry pear, Thang loy. Handling: Press the flesh of the dragon fruit. If it has a little give, it is probably ripe. If it is too soft, that means it is overripe, and the texture will not be as good. If it is hard, give it a few days before you eat it. Avoid fruit that has dark blotches or bruises, brown dry spots, or dry spines. Using a sharp knife cut right through the middle, run a spoon along the edges of the skin and scoop the flesh out.